Those darn hamstrings. Their stubborn inflexibility is a source of frustration for many yoga practitioners, often because they know (or have heard) that forward bends would help their sore and stiff backs—if they could just get past their hamstrings. More than vanity is at stake here; lower back problems, hip problems, and knee problems can be traced, at least in part, to tight hamstrings. So why are the hamstrings so resistant to stretching? Three factors are worth considering: the anatomy of the muscles themselves, the postural habits of our well-heeled (shoe-wearing) culture, and counterproductive efforts to stretch them. 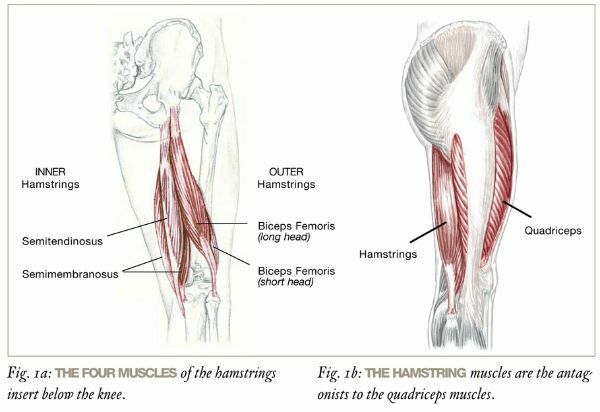 Let’s first take a look at the anatomy of the hamstrings. The hamstrings are muscles that constantly work to hold us upright and help us walk and run. Because of the heavy-duty nature of their work, the tissue structure of the hamstrings is correspondingly tough. An abundance of built-in connective (i.e., fascial) tissue makes the hamstrings harder to stretch than other muscles. But tissue structure alone doesn’t fully explain their resistance to stretching. The hamstrings have two straightforward functions: they extend the hip and flex the knee. When we walk or run, our hamstrings contract powerfully, propelling us forward by pulling the thigh bone back—thus extending the hip in a backward-bending motion. Then, when we pick up our foot to swing it forward for the next step, the hamstrings contract to bend the knee, so that we don’t literally trip over our own feet. The hamstrings have two straightforward functions: they extend the hip and flex the knee. Overall, what the hamstring muscles do depends upon what the foot is doing. When the foot is fixed and weight bearing, the hamstrings pull the thigh back, extending the hip and propelling us forward. When the foot is free to move, the hamstrings contract to bend the knee by pulling on the lower leg below the knee. 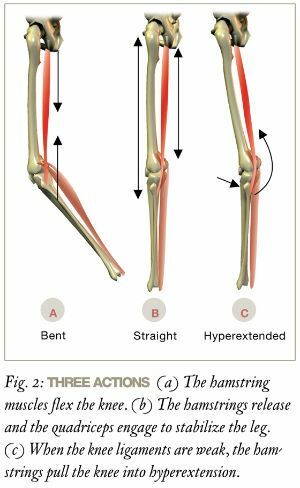 But here is the paradox: the hamstring muscles can either flex or extend the knee (while most muscles do one or the other). Although these muscles are intended to simply flex the knee, when the knee goes into hyperextension, the hamstrings start to participate in extending (to the point of overstraightening) the knee instead. Here’s how. The hamstrings attach at the head of the shin below the knee, while the calf muscle on the back side of the leg attaches to the thigh bone above the knee. Usually the quadriceps contract to extend the knee, while the hamstrings release to allow the leg to straighten (Fig. 2). At the end point, when the leg is fully straight, the ligaments inside the knee prevent the knee from hyperextension. But these ligaments can be weakened from the habit of forcibly locking the knees (pushing the knees back until they won’t go any farther). Just as the brakes in our car wear down if we constantly ride them, the ligaments of the knee weaken from the habit of locking the knees. Then the hamstrings begin to dominate in a role that they weren’t meant to play. When weak ligaments allow the leg to go beyond straight, the hamstring muscles (as well as the calf muscle) pull the knee into hyperextension. Sore hamstrings may also be caused or exacerbated by our footwear. Our shoes, with their raised and cushioned heels, prevent us from using our heels properly when walking, and tend to shift our hips forward when standing. This places a burden on our hamstrings, while leaving our gluteals underdeveloped as postural muscles. In comparison, barefoot cultures show a significant difference in muscle development related to posture. When the hips are habitually shifted forward and the knees hyperextended (i.e., locked back), the hamstrings are recruited to stabilize posture, effectively dismissing the quadriceps and gluteal muscles, which normally support proper alignment of the pelvis over the legs. To hold the hips in place, the hamstrings tighten the connection between the sit bones and the back of the knees. The resulting forward shift of the hips causes the upper body to sway back, rounding the upper back to compensate for the forward shift of the hips and the hyperextended knees (Fig. 3). The hamstrings get tighter and tighter from chronic contraction, and the cycle of hyperextension and muscle tension begins. The hamstrings get tighter and tighter from chronic contraction, and the cycle of hyperextension and muscle tension begins. The hamstrings don’t necessarily feel tight or sore while we’re standing because of the way the bones are balanced in line with gravity—the sit bones balance directly over the locked knees. Only the upper part of the hamstrings close to the sit bones, deep beneath the gluteals, contracts. We may not notice the grip of the upper hamstrings until we try to bend forward. Then, we immediately find that the pelvis cannot tip forward, and we have little choice but to bend from the lower back instead (Fig. 4). 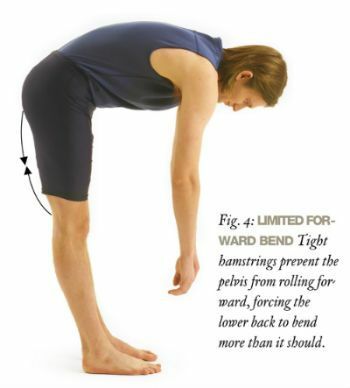 Bending from the lower back can lead to a number of aches, pains, and injuries, since the lumbar spine (i.e., the lower back) wasn’t built to bear weight in forward-bending positions. Ideally, the leg muscles, gluteals, and upper body do the heavy lifting, while the spinal muscles keep the spine straight. But if your hamstrings are tight, even bending the knees to keep the back straight when lifting a heavy load may not be enough to protect your lower back from muscle spasms or damaged or ruptured disks. Back pain is not the only negative result of tight hamstrings. Many people suffer chronic pain deep in the buttocks, which actually arises from this tension in the upper hamstrings, made worse by friction—in this case, the rubbing caused by pressure against the sit bones and tendons from sitting in chairs and car seats, or even from carrying a wallet in your back pocket. 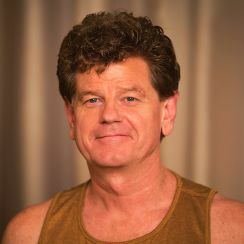 Hamstring problems also afflict many who can bend forward easily, launching into a swan dive from tadasana (mountain pose) to uttanasana (standing forward bend), as they fold neatly at the hip creases. Although these people don’t think of themselves as having tight hamstrings, tension hiding in the upper hamstrings can result in a tear at the attachment of the tendon to the pelvis during advanced asana practice. In some yoga classes you may hear the instruction to lock your knees during certain standing, balancing, and forward-bending poses. The intention is to keep the legs straight. But as we have seen, this is a harmful and counterproductive instruction that works against our joint and hamstring health, and doesn’t allow for progress in stretching the hamstrings. If anything, we need to consciously unlearn this habit, and reinstate the muscles of the thigh in their proper role. Supta padangusthasana is one pose in which we can explore the proper activation of the thigh muscles and stretch sore hamstrings accordingly. Many yoga students tend to lock the knees in this classic hamstring stretch, which prevents them from progressing in the pose and puts them at risk for injury. Supta padangusthasana itself is quite simple. While reclining on the floor (the supta part), take one leg up and either grab the big toe (the padangustha part) or place a yoga belt around the foot at the ball of the big toe. Straighten your leg and then stretch the hamstrings by pulling on the belt to bring the leg closer toward your chest—ideally while maintaining a natural inward curve in your lower back and keeping the other leg straight and in contact with the floor. Our bad habits usually take over when we begin to straighten the leg. The temptation is to hold the foot in place with the belt and then straighten the knee by pushing it away from the chest. But this action, which locks the knee into extension, actually contracts the hamstrings as soon as the knee locks. One sign of this hyperextension is that the kneecap turns toward the opposite shoulder because the thigh has rotated inward as the knee locked. Often the contracted hamstrings will pull on the sit bone and tuck the pelvis under, flattening or even rounding your back on the floor. If you are especially tense, you will have difficulty straightening the leg at all—not just because the hamstrings are tight, but also because they are actively contracting out of habit, and therefore you are unable to use the quadriceps to straighten the leg properly. Reversing this tendency in supta padangusthasana is a simple matter and works to strengthen the quadriceps. Bend your right knee to place a belt around your foot, and then keep your knee bent. Draw your knee a little closer to your chest, allowing the thigh to rotate out slightly, so that your hip releases down to the floor. This slight outward rotation allows the femur to slide into place in the hip socket, and helps you maintain a slight arch in your back. Keep the chest open and your neck relaxed and long. Keep your hip firmly grounded on the earth, and your knee exactly where it is. With the help of the belt, swing your foot up into place, and straighten your leg by contracting your quadriceps, drawing energy from your kneecap toward your hip (Fig. 5a). As your leg straightens, press up against the belt with the ball of your big toe while drawing your outer hip down toward the floor. Pressing through the ball of the big toe will spiral your leg in, adjusting the outer rotation you allowed in step 2. Keeping the outer hip grounded will balance that inward spiral with the outward spiral at the top of the thigh by which you grounded the femur in the hip socket—so that in the balance between the two, the leg stays centered. A sign of success is that your right kneecap will be lined up with your right shoulder rather than turning to the left (Fig. 5b). Resist the temptation to lock your knee at the end. Here’s the sure sign you have gone too far: your kneecap will rotate inward to point toward your left shoulder, and your outer hip will likely come up away from the floor. Your lower back may also flatten against the floor. These are signs that you have locked the knee and that your hamstrings are tightening rather than submitting to the stretch. Now we can return to the example of uttanasana. The trick is to prevent the hamstrings from contracting and locking the knees into extension, since the contracted hamstrings will immediately grip the sit bones and pull them down, preventing the forward bend at the hip joints. We need to unlock the hamstrings by bending both the knees and the hips, releasing them from their habitual state of extension. Stand with your feet about hip distance apart and your feet parallel. Place your fingers on your hip creases—the place where your hip folds when you lift your leg—and bend your knees, keeping your thighs parallel and in line with the centers of your ankles. Now, while keeping your knees bent—and resisting the temptation to straighten and lock them—bend forward at your hip creases (where your fingers are) while keeping your back straight. This is harder than it seems: the pull of the hamstrings as your hips begin to fold forward will begin to pull your knees into extension. It’s a big temptation to let them do so, since you may think that the hamstrings will get a better stretch when the legs are straight. But it’s self-defeating to allow them that luxury. Keep your knees bent until you fold forward as far as you can go with a straight back—you may have to put your hands on supports, such as a couple of blocks. Only now should you start to straighten the legs, using your quadriceps more than your hamstrings to extend your knees. Lift your toes to help you pull energy up through the front of your legs. (And be aware that gripping your toes on the floor only serves to tighten your calves and hamstrings.) Straighten your legs by pressing down through your heels while drawing energy up on all sides of your thighs, especially through the front of your thighs (the quadriceps), but also lifting up through your sit bones (Fig. 6). Think of it as stretching your heels and sit bones away from each other. Straighten your legs with the intention of maintaining the slightest microbend in your knees. 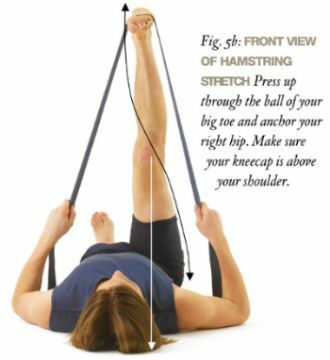 The microbend keeps the hamstrings engaged in a good way. Maintaining the tiny bend in the knees keeps a healthy resistance while stretching, and ensures that the quadriceps will continue to work as they should, rather than surrendering to the quick fix of locked knees and a rounded back. You’ll be rewarded with a healthier lower back and healthier knees, as well as a balanced and more beautiful posture!